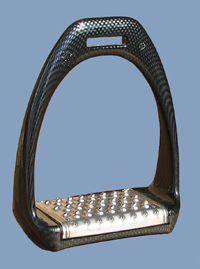 The New “Carbon Fiber Sport” and “Carbon Fiber Sport Flex” mark a significant achievement in the science of equestrian stirrup technology. The Carbon Fiber reinforced Polymer, a material made in Switzerland and used in the aerospace industry, incorporates the advantages of maximum shock absorption with superior strength. The stirrups also feature a beautiful Carbon Fiber finish.